Alexis Tsipras, the leader of the Radical Left 'Syriza' coalition, will today meet the Greek President and be asked to form a government. THE COALITION representing Greece’s left-of-centre parties will today begin the process of trying to form a new government, after the party which took the largest share of seats following Sunday’s election failed to form a cabinet. New Democracy leader Antonis Samaras abandoned attempts to form a government yesterday, just one day into the three-day window afforded to him, after it became apparent that Samaras – whose party took 108 of the 300 seats on offer – would not be able to form a stable government. His concession came after the anti-bailout ‘Syriza’ coalition, the second-largest party in parliament with 52 seats, said it would not share power with Samaras’s pro-bailout party. I tried to form a coalition government with two goals: that the country remain in the euro and bailout policies change to include growth measures… I did what I could to get a result but it was not possible. As such, I have informed the president of the republic and handed back the mandate. The need for exploratory talks with Syriza came after the other party in the outgoing national coalition, the socialist PASOK party led by Evangelos Venizelos, suffered an electoral bloodbath and lost 119 of its previous 160 seats. That defeat meant that the two outgoing coalition partners, who had formed a temporary cabinet last November in order to implement urgently-needed measures under the EU-IMF bailout programme, were two seats short of maintaining their majority. The baton now passes to Syriza itself, led by Alexis Tspiras, who now has three days of his own to try and cobble together a coalition with a majority in the 300-seat parliament. His bid will formally commence at 2pm, today, when he visits President Karolos Papoulias to accept his mandate. His prospects for power essentially hinge on whether he can form a coalition with the rest of the anti-bailout parties. This include the Independent Greeks party, a splinter party from PASOK with 33 seats, the Communist bloc with 26 seats, the Democratic Left movement with 19 seats, and Golden Dawn – the far=right party, often connected with neo-Nazism, which won 21 seats. If those parties succeed in forming a coalition, the result could well be withdrawal from the second EU-IMF bailout programme and the abandonment of the Euro – moves that would anger leaders like Germany’s Angela Merkel, who insists Greece must undergo fiscal reform. Any successful coalition would not only be a patchwork of loosely-connected parties, however, but would also only command 151 seats of the 300 in the parliament – making the prospect of forming a stable coalition a difficult, and perhaps impossible, one. 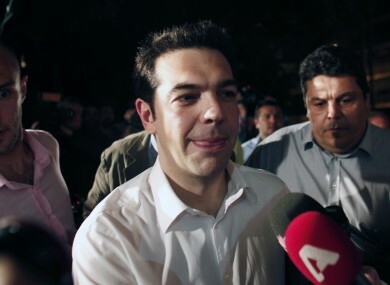 If Tsipras does not succeed, the mandate will then transfer back to Venizelos’s PASOK party – which will almost certainly fail to govern given that Samaras, the only realistic coalition partner, has failed to do so himself. Email “Radical Left coalition to begin attempts at forming Greek coalition”. Feedback on “Radical Left coalition to begin attempts at forming Greek coalition”.